Benjamin Netanyahu, Israeli PM, facing an indictment on corruption charges is pressing ahead with an April election and playing the Trump victim card in his defence. He clearly hopes the voters will exonerate him even if the courts don’t. 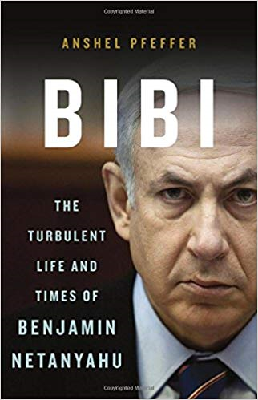 Born 21 October 1949 10.15am Tel Aviv, (rectified time) he is regarded by many as an embarrassment, a threat to democracy, even a precursor to Donald Trump and has gone out of his way to be a friend to strongman dictators. He is a Libra New Moon with his Sun in an expansive square to Jupiter in money-minded Capricorn and sextile Mars in flamboyant Leo. His Mars is in a formidably determined conjunction to Pluto, both in his legal-affairs 9th. He’s mounting what Haaretz the liberal Israeli newspaper describes as an OJ Simpson defence. Solar Arc Pluto is in the dead-halt conjunction to his Sun which picked up in 2018 when the charges were mooted and will continue for a while yet. He also has Solar Arc Uranus conjunct his Saturn in effect over the next few months which suggests high irritability with his freedom being restricted. 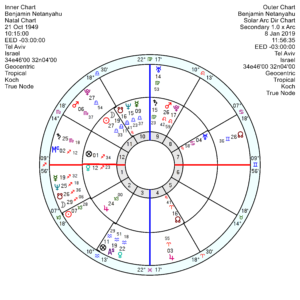 Tr Saturn is also squaring his Neptune before and after the election which will be uncertain and worrisome; and is anyway (on this birth time) at the lowest ebb of his chart moving through his 2nd house till 2020. 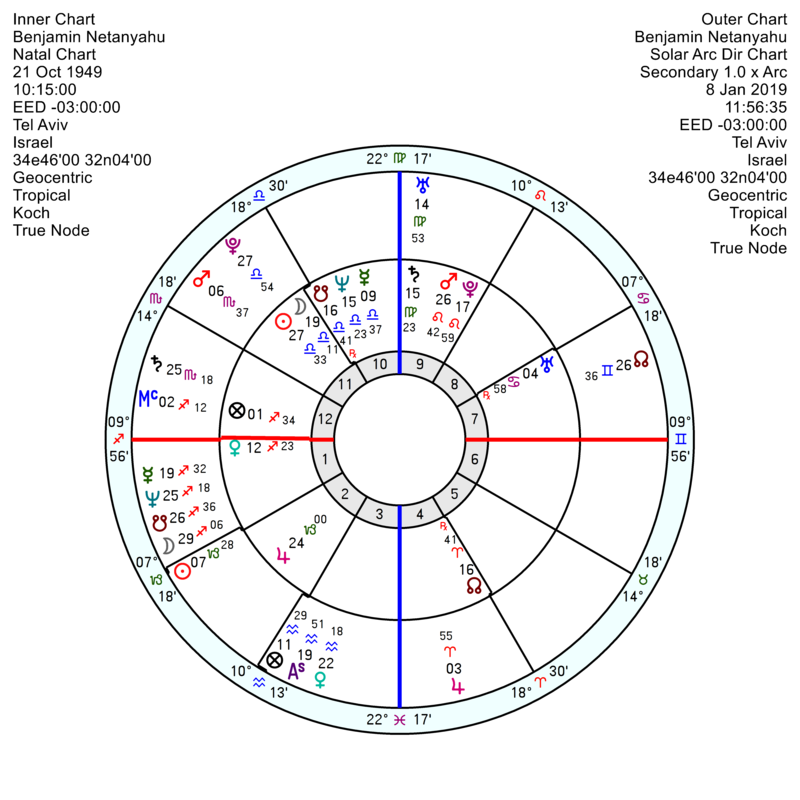 His Jupiter has always been his guardian angel and is around mildly after the election and more strongly in 2020/21 as tr Pluto is conjunct his Jupiter. But he’s also got a major setback in late 2020 from Solar Arc Saturn square his Mars. Mars Pluto individuals never give in easily or admit guilt but plough their way ahead denying everything vociferously – and sometimes it works. The Israel chart is on high alert till mid February with tr Uranus trine the Mars. 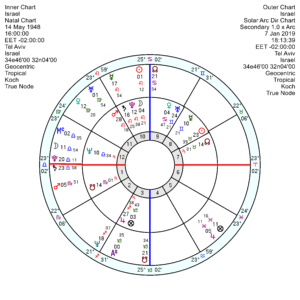 Although there are pressures for change with tr Pluto trine their 8th house Taurus Sun in 2019/2020, the possibility of much movement is unlikely given how fixed a chart it is. And their repressive Saturn Pluto is moving by Solar Arc to conjunct their Ascendant this year and on till 2022, so there’ll be little softening of their image. Though there will be emotional upsets and perhaps voter outbursts from late May 2019 onwards with tr Uranus square the Israeli Moon, repeating into 2020. 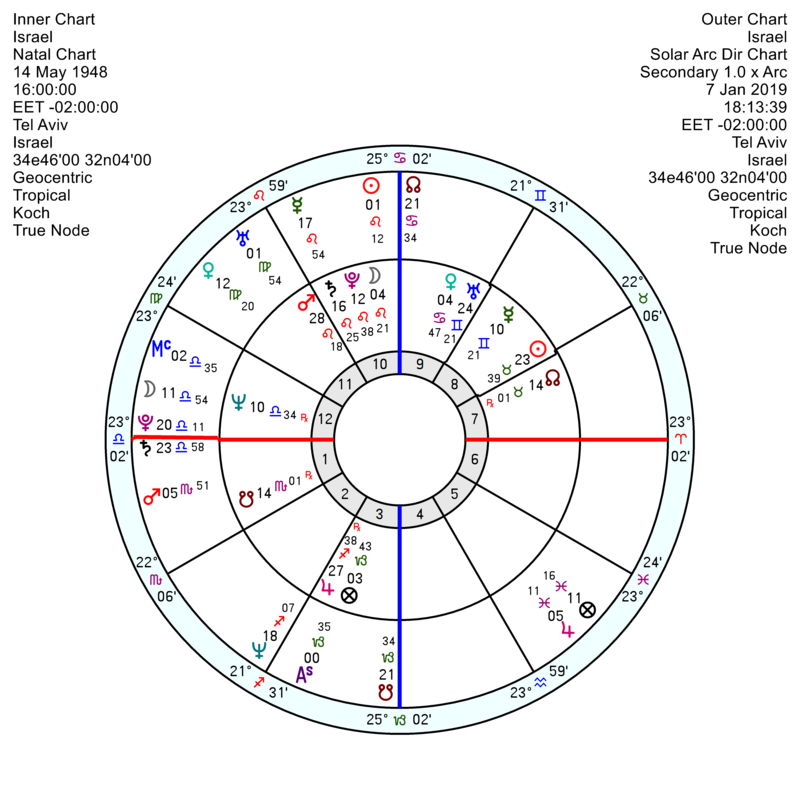 2021/22 will ratchet up the strain with tr Pluto opposition the midheaven which theoretically should bring an inner transformation and purging of old memories, but may run into fierce resistance. A mutinous domestic period of some years follows as Pluto moves through the 4th stirring up internal dissent. 2021/2022 also sees tr Uranus square the 10th house Pluto, again attempting to kick start reforms and a new direction, with some old alliances breaking up. The next few years will be tumultuous for Israel. Eurovision Song Contest will be held in Tel Aviv mid-May 2019 (final will be May 19th). This is a big deal in the country, since they have very little hope hosting any other relevant International Event. ESC is also a very liberal event, ran by always politically corrent Swedes and especially loved by gay communities around The World. Israeli Government has already done their best to soften their image for the event, for instance, they backed off from taking the event to Jerusalem, although people of Jerusalem may have felt relieved. It’s quite possible this event will sparkle something.